I am often asked "Why a Glock" and "Why 9mm"? A little background on the BCM 03 MSF Chest Harness. Let me start off by saying I didn't invent the 2 piece chest rig with yoke and hydro carrier. The original design goes back to the late 70's / early 80's. 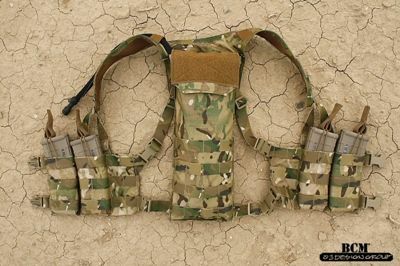 The South African M83 battle vest is probably the original 2 piece chest rig that featured a yoke and hydration carrier. I have been using 2 piece chest rigs since 2000 for both work and training classes. My first 2 piece chest rig was a S.O.E. chest rig with hydro carrier that I wore over my body armor for SWAT. The picture in my avatar (pic taken in Feb of 2002) shows me wearing the 2 piece chest rig over my body armor. This was before body armor carriers covered in PALS webbing was readily available on the civilian / law enforcement market.